Possey Power: Hello from Lamoni!!! This is Kate, me, and Aubrey. They're roommates and they live a few doors down from me on our hall. We live on Solah, each student belongs to a "house." Solah is the oldest and most popular female house at Graceland University (which is where i go to school. fyi. haha) These 2 are freshman and each have a few cousins here at school with them. They just met, but they are hilarious to watch and be around. Aubrey is the world's most sarcastic cinic and pessimist. Yesterday she came into my room and said she's never seen so much positivity in pictures and signs in her life and had to leave cuz it was overwhelming her. Haha. Awesome. This was at our Solah Inductions last week. We each had a candle and then blew it out. I can't believe i showered for it, but everyone else was getting all ready for it. . so. .
We had a lot of welcome activities for the school and our hall. One of them on our hall was a tye dye day! I don't know, but everyone here is like super into tye dying. I haven't done it since like elementary. . but it's cool! haha i liked it! These are some girls on my hall! 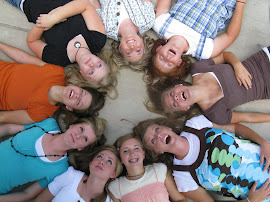 Kate, Kayla, Lindsay, Amantha, Aubrey and me! Lamoni is only 3 miles from the Missouri border. And they are lots of corn fields and bean fields around! It's very green and pretty! There is a sign as we enter Lamoni that says something about being aware of buggy's and horses, to respect the Amish people in our town. Haha which is also awesome! Lamoni is actually a very cute little town! It should be filmed on a Lifetime movie. This is one of the two hotels in town. It's called Chief Lamoni Motel, which i found amusing, since he was a king, but whatever. The school is sponsored by COC (Community of Christ- which used to be RLDS) but i don't have to take any classes or anything for it. Lots of kids' families are COC, but i haven't met many that are very active and into the religion. We had a a big religion talk last night in my room, which was good and neat. My roommate went to a Restoration high school, which is a break of COC, there were Mormons at her school, but she doesn't claim any religion. It's neat being able to talk to her about religion because she's knowledgable in it, but not judgmental about anything. She's really awesome! i love her! She's a freshman from Independence, MO. There is something very great that I have come to appreciate each fall for the last 3 years. It is college. Higher education, better jobs, more money, competitve world, we should do it, blah, blah, blah. Actually the whole school thing is important and awesome, but college life is SOOOO easy! I love it! Sure there are times where i have to push myself physically and mentally in basketball, which is what's paying for my schooling. . . but it's a good life. I wake up each late-morning to get ready for a 50 to 75 minute class. I got to 2 or 3 a day, with breaks in between and prepared meals at my behalf in the commons, or if i'm running late in the "Swarm" which is our on campus fast food place. Things are going good! Basketball is going good! We're having a team bonding day today, instead of practice. The girls are all pretty cool. My ward family is Awesome and so supportive! The RS presidency drove a 1/2 hour yesterday to come visit me and the 3 other mormon girl's that go here, and took us for ice cream. I get to give a talk on Sunday on Nurturing Testimonies and am going to be working in the primary! So things are looking good! If only i could stop procrastinating all homework assignments, things will be golden! Way to be out on your own! I loved that time in my life! It was full of adventure and seeing new things! It sounds like you are enjoying it! Keep it up! HMMMMMMM I think I like the EAC pict's better.